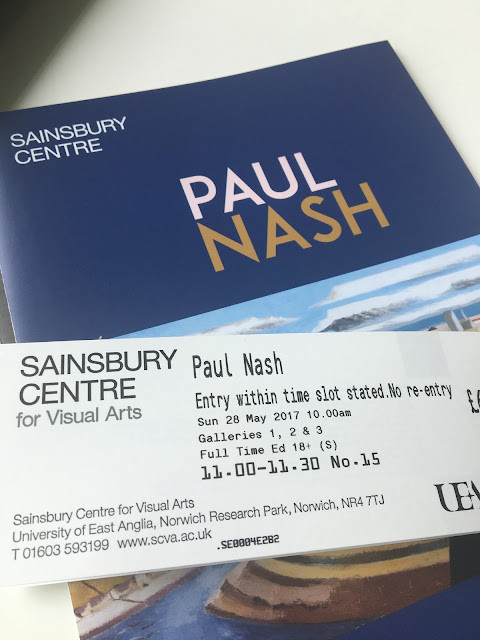 Over to the Sainsbury Centre at the UEA yesterday to see a major Paul Nash show, expanding on work I saw at the Tate last year. It was an excellent exhibition in a lovely space at the UEA. It began with some of Nash's wartime paintings, particularly those painted in the shattered landscapes of Passchendeale. There were also some familiar paintings showing landscapes such as the Wittenham Clumps, which Nash returned to again and again. There were also the sea defences close to Rye, and other landscapes. There was also a bonus of several Antony Gormley statues placed around the campus which could be engaged with. If you're in the Norwich area, this is well worth a visit.